I’ve already written about Ghosts. 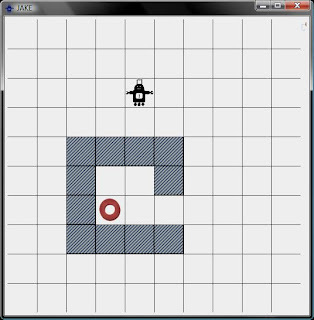 While working on the example programs to accompany JAKE, I’ve created a KillerGhost – a subclass of ghost that kills any robots it touches. 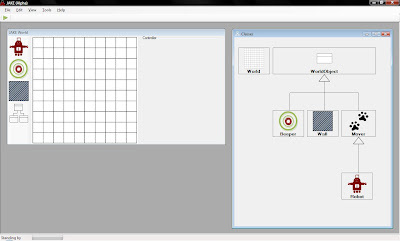 All of this was done within the JAKE editor – it’s something (albeit difficult) that a student could do themselves without having access to the underlying JAKE Java code. So we have a ghost that can kill robots. Since Movers can use different icons (using the name of a file in the same directory), we can also create a new PacMan class. 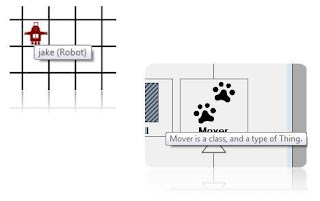 This class is a type of Mover, so we can change its icon and give it move() and turnLeft() instructions. 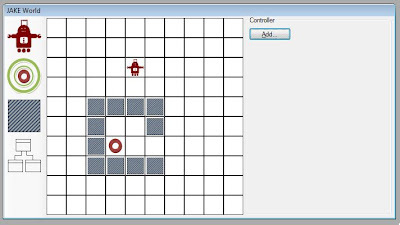 We can create methods on the controller (buttons) to move our PacMan character about the maze. Since it’s a type of Mover, it can’t move into walls. 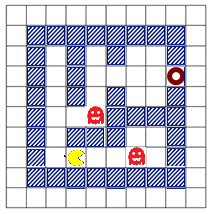 If we add extra beepers to the world, the PacMan object can pick them up to use as food (as in the original game). 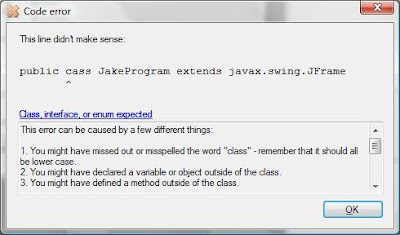 Up until now, JAKE has had some flickering in Java, especially when running programs with lots of on-screen objects. 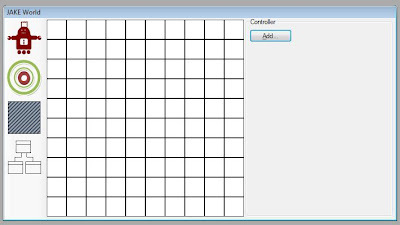 From now on, there’s a lot less flicker when the Java programs run, and this is reflected in the PacMan video I’ll be posting later tonight. These videos show the creation of two simple Java robot programs in JAKE, based on an earlier blog entry about creating control events. The robot/wall graphics are a little choppy, but that seems to be something to do with mixing Java and the screen-capture software. As well as the new world editor, there have been some other small updates to JAKE this week. Finally, the WorldObject class has been replaced by “Thing”. This saves any confusion from having the “World” and “WorldObject” classes next to each other in the diagram; we didn’t want it to appear that WorldObject was an instance of World. So, now, all objects in the World are “Things”. It’s been noted [e.g. 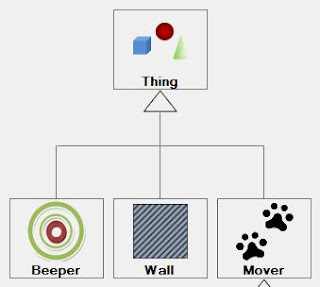 1] that showing the static class structure is important in teaching materials and tools. BlueJ, for instance, places a lot of emphasis on this. The JAKE IDE dynamically compiles a class diagram as classes are added to the JAKE program. 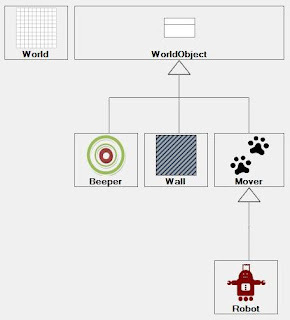 Every program starts with a default class diagram that shows all the classes in the main JAKE package: World, Mover, Robot, and so on. The diagram uses a variant UML notation, with arrows for generalisations. The classes themselves, however, don’t have methods or attributes. Instead, they’re represented by a box with an icon and caption. The class diagram is shown alongside the main program editors in JAKE, but it can also be maximised. 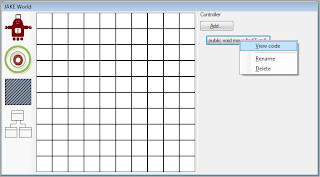 In later versions, the maximised diagram could be printed through the File menu. 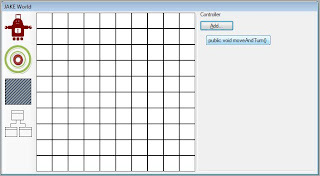 The diagram window automatically scrolls if the diagram becomes too large, but JAKE’s simple class structure makes this unlikely. Börstler, J., Hall, M. S., Nordström, M., Paterson, J., Sanders, K., Schulte, C. and Thomas, L. An Evaluation of the State-of-the-Art of Object-Oriented Example Programs in Introductory Programming Textbooks. In inroads SIGCSE Bulletin. (July 6-9 2009). ACM New York, NY, USA, , 2009, 126-143. 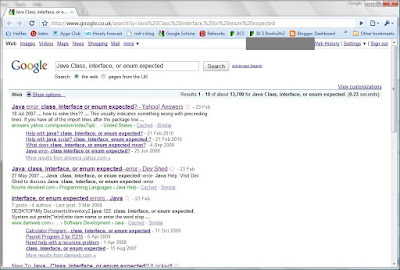 Debugging: Class, interface, or enum expected. Class, interface, or enum expected. Now, I know what it means, but would a new programmer? To understand this message, you surely need to know what an interface or an enum is – neither of which are likely to be taught in the first few lessons. 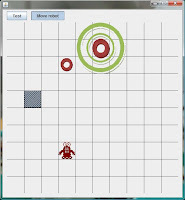 Therefore, JAKE aims to make debugging a bit easier. 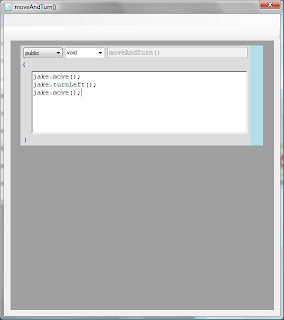 When a JAKE program is compiled, the IDE reads the feedback from javac and tries to translate it into simpler language. 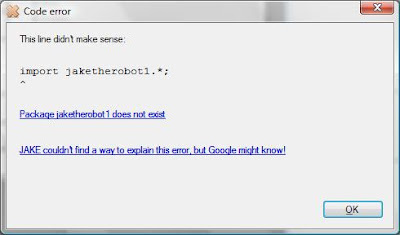 Obviously, it’s important to maintain parity with the Java error itself, so the actual error message is always shown. It’s just that JAKE also gives a short, plain-English explanation too.